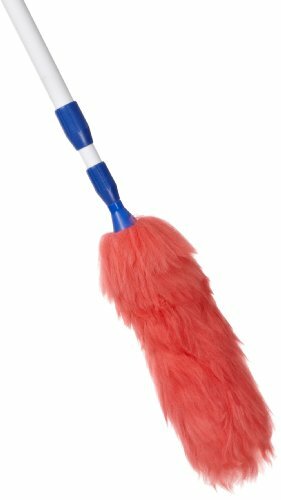 The Impact 3106 white extended twist and lock lambswool duster can be used to dust light fixtures, ceiling fans, window treatments, or other hard-to-reach areas. Lambswool attracts dust without leaving streaks or scratches and may be washed. The duster can extend in length from 33" to 60". A twist and lock feature on the white handle allows the user to set the length. A hole near the end of the handle allows the duster to be hung for storage. Dusting tools (also called dusters) are used to remove dust from walls and furniture. They consist of a dusting head or mitt, a wand or frame, and a handle. Dusting heads and mitts fit snugly over a wand or frame, which is connected to the handle. The frame provides support for the shape of the dust head, which is made of dust-collecting yarns or fabric. Length can be adjusted from 33" to 60"